Unburden yourself today in My presence. Do not come to Me and tell Me about all of your burdens and concerns without giving them to ME, says the Lord. Bring them to Me, and leave them with Me to handle. You came to Me because they were heavy and miserable and weighing you down. Don’t just talk to Me about this! Give all of them to ME! I will handle all of them. Do you want to do it or do you want to entrust them to ME? You have carried them. You have fretted. You have sweat beneath the load. You have struggled. You have buckled under all of it, and felt that you could hardly keep going. Just stop merely talking to Me about all this and give all of it to Me. I said ALL. I want you to be free of all burden. Don’t just give Me the hard things and you carry the easier things. Shift all upon Me and enter into My rest. Take a break. Relax. You do not need the stress! I Am not the one that imposes burdens upon you and I Am not the author of stress, says the Lord. Trusting Me with it means that you cease from your own work. That means that you do not have to resolve issues that you give to Me. It means that you do not have to understand. You do not have to work it out. You do not have to walk it out in your own ability or strength or resolutions. IT MEANS allowing ME to carry the load, GIVE you the solutions and show you the easy path that I have paved for you to walk in with ME! That is right. EASY! MY YOKE IS EASY. IT IS LIGHT? What about yours? Heavy and difficult? I know this. So what will you do? Will you walk with Me, shifting it upon ME in absolute confidence that I Am capable of handling everything? I do not add complications. I solve them, says the Lord. The quagmire is NOT My path and the heaviness did not come from Me. I Am your burden bearer. So cast all your cares upon Me. If you want to carry the load, you can. But you do not have to. I only have good things in store for you, and I want you to begin with the gift of peace and REST! Take this today, and rest in Me and stay at peace in ME as you fully believe that I have absolute ability to handle every person, place and thing in your life, and I can handle you, too. 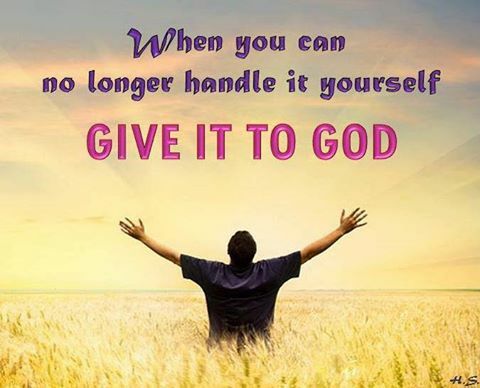 Let Me control it and you will be able to sign with relief as you unburden yourself and totally trust in My love to take care of all things pertaining to you and those you love, and to take complete care of you, too, says the Lord.